First, a bit of history: during the last months of 2009 we talked about a KDE sprint in Brazil, as a way to foster the local community and also because it is currently too expensive to fly all of this people to events in the US and Europe all the time. We reasoned that we could continue to send people (a few at a time) to the sprints and events, but something local was needed to care for the growth of KDE in Brazil. Also, we did some discussion in order to identify the needs of the community, and what prevents more participation in the global project. As most of you have seen in the planet, there are people here working in projects related to kdegames, kdeedu, amarok, kdepim, plasma, kdevelop… But some of these contributions are developed in parallel, and only after much effort (and hand holding from the veterans down here) we manage to integrate them effectively into trunk. One of the issues identified is the language barrier, which is something we have to work with, but should not prevent participation in one form or another. There are others (documentation in portuguese, revamp of the local site, establishment of a local promo team) that are already happening, but could benefit a lot from a concentrated effort, such as a sprint. We have a very good presence at the big events here like fisl and latinoware, but these are venues where it is difficult to sit down and actually work together, like we can do in sprints or hacking sessions. 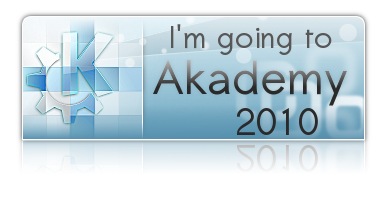 With all of the above in mind, we found a nice solution: Akademy–BR. An event for the local community, with the majority of content in Portuguese, and structured as a super-sprint. We will have three days of events: one day of talks, one day of unconference, and lots of hacking sessions in between. It is not only for developers: promo, translation and website teams will also be there to work together on br.kde.org, and also to refine our plans for having the best possible KDE presence in fisl 2010 and LatinoWare 2010, among other venues. The dates chosen were April 8, 9 and 10. We are following on the steps of Akademy-es (thanks to the spaniards for pioneering local Akademies! ), but using the sprint format as our discussions appear to suggest that this produces the best result when community-bonding is needed (working on smaller, focused groups, mixed with talks and planning) . The goal is not to only TALK about KDE, but to actually sit down and work together on the various individual projects, lifting the barriers that prevent people from contributing more directly to trunk, usually due to lack of confidence or lack of information on how to do so. In the process we hope to convince people to help maintaining KDE code, mainly in edu and games, as this is very much needed. I mentioned that we have dozens of people working on KDE in Brazil, but we are all scattered geographically and sometimes only meet once a year if at all. So our initial goal for this sprint was to have in-between 12 and 18 people. However, just the initial call for action on the kde-br mailing list already produced more than 30 people signed in (in 3 days), and this does not count the brazilians that were at Camp KDE, or the guys from iNdT. Due to concerns regarding organization, budget and venue capacity we had to limit this first edition to 30 people (and a half), and I think we achieved a good mix of old and new blood, developers, designers, web and promo people, men and women. And at least one baby is confirmed as well, if you are wondering about the half person mentioned. The list of confirmed atendees (in portuguese) can be found here. The location is very near Salvador, Bahia, at the NE part of Brazil. This is where the LiveBlue group (from Sandro and Tomaz) is located This proximity will save us a lot in transportation costs. Salvador is also a well connected city, with direct flights from most capitals in Brazil, which makes air travel cheap from other areas of the country. Sandro also scouted a very good location, a hostel that we can use to both sleep and host the event, at a very reasonable price. LiveBlue will be doing the hardest part regarding organization, and I am very glad this group exists and very happy for the work they are doing (and have already done) for KDE in Brazil. My personal goals at the event are related to KDE Games and Edu: I hope we can get some developers up to speed with their contributions, and assemble local teams for projects with the intention of working with the bigger KDE Games and Edu community. Suggestions are welcome, as we are now in the process of closing the structure of the talks and setting up the pre-event coordination, which is done via the akademy-br mailing list (thanks to sysadmins for that). In closing, many, many thanks to the e.V. members and to the board for their help in setting up this event. I hope we can make it a success and produce high quality work that will jumpstart several projects for the growth of KDE and FLOSS in South America. Today is the first day of Latinoware, at Foz do Iguaçu, Brazil. The website lists this as the biggest edition so far, around 4,000 people already registered. And if you go to the site you will see that KDE is listed as one of the supporters, as well as iNdT (Nokia’s research institute in Recife, Brazil). The event schedule shows 5 KDE presentations in the first day, including Anne-Marie Mahfouf, Artur, Hélio, Caio, Eduardo and James. For tomorrow Adrian de Groot is listed. And, to top it all, there will be no less than 3(!) courses on KDE/Qt programming. Sandro and Tomaz will first teach the basics of Qt programming, and then will do another round as a crash course specific to KDE 4 application programming, and geared towards getting even more contributors to the project here. Then Jesus will do yet another course, this time focusing on what is new in Qt4.6: State Machine Framework, Animation Framework, new features of QtWebKit, QGraphicsAnchorLayout and QGraphicsEffect. Each of these courses is a full 6h session, btw. I liked how these were layered, so people of all skill levels could find something appropriate. KDE will also have a booth there, and the nice people from the LiveBlue and KDE-MG user/developers groups are making sure the community aspect is not overshadowed by our technical presence at the event. In fact, they are organizing a bunch of activities that aim to increase the interaction with would-be contributors and basically everyone at the conference. One example mentioned by Amanda is a "suggestion whiteboard" and contest for new KDE features and ideas, which will be always opened. And it is rumored that there will be t-shirts and other cool stuff as well, all made by local user groups. Fred from SLEducacional (brazilian largest group of educators and free software enthusiasts) will also be there, hopefully wearing his KDE hat in-between GCompris demonstrations. Well… I am eager to read the reports from Foz over the next few days. Hum… and what does this have to do with the blog title, one might ask? Well, this is the sixth edition of Latinoware. And we had no KDE presence in the first three. Then, three years ago, on the fourth edition, I sent a submission to talk about KDE Games there, and started building bridges, together with Helio. Last year we had a substantially larger presence and this was important to begin forming several groups of people hacking KDE on different areas of the country, and this has exploded into a much larger presence today. And I realize this is yet another strength of open source and open source communities: the ability to layer your work on top of what was done before, incrementally. It does not depend on one or two people doing all the work: you can make your contribution and let it run wild, and see what comes out of it. Just like building KDE4, where you start with the pillars and a few years later there is a explosion of creativity on top of them, the community building appears to work in much like the same way, growing quickly and surprisingly positive directions. I can only imagine what we will be able to achieve by next year, in both fisl and latinoware. Special thanks to Adrian and Anne-Marie for coming all the way down here, and help making KDE even better in South America! My first Qt-based project was a commercial database front-end, the Arca Database Browser, released in 2003. At the same time we decided to release an open-source version of it on SF.net. This was before Qt had SQLite support, btw… well, It turned out to be very popular, and despite my lack of updates for the past 3 years there are a lot of people using it, at least according to the feedback I get occasionally and the SF.net statistics. The first one is the most important 🙂 My son Theo was born last Monday, July 27th, 5:34AM, at home, after a rainy night, and just before the sunrise. He arrived 2 weeks before the predicted date, sparing us from the worries of the last days. The second one will arrive tomorrow, one week after the predicted date… KDE 4.3 contains a lot of work from a group of developers I admire a lot. I could not contribute much during this cycle (see gift #1), so good job, people. And it will (I hope) be followed by more gifts, as my 40th birthday is also tomorrow (August 4th). A lucky week, will be hard to top. Last week we had a great time at fisl, in Porto Alegre, Brazil. The event was huge, more than 8,000 people, including the president of the country, Lula. Politics aside, it is nice to see official support for FLOSS events, and this surely gives credibility to the work we are all doing. KDE was present with several talks. Adenilson presented his work in kde-pim. Alexis Menard talked about Qt everywhere. Tomaz Canabrava gave a beginner’s introduction to KDE 4, and Leonardo Cunha showed Qt Kinetic. Sandro Andrade detailed his work in visualization for KDevelop as part of the GSoC, and we had two one-hour panels on Saturday as well: the first was the KDE Brazil Users and Developers Meeting, and the second was a space to plan KDE Brazil’s actions for 2009-2010. I also gave a lecture about open source game development processes, focused on desktop games, with an analysis of kde-games and gnome-games. The room was full (about 200 people I guess), and the talk was also relayed to another location via video, so I was a bit nervous at first, specially because none of my two computers worked at first with the projector (cable problems…) And Stallman (the previous presenter in the auditory) took his time to disconnect 🙂 But thankfully everything worked (thanks to Alessandro Silva for the help), and the presentation was great: we could engage in a very interesting discussion about tools for game creation and the relative advantages of using 2D and 3D techniques. I am swamped right now trying to catch up with the work that has piled up during last week, but I promise to elaborate on it in the near future. If you were on the lecture, we will soon have a list to discuss those ideas, and maybe they will end up in some KDE project one day. On another note, it was nice to meet Leslie Hawthorn. I had a chance to coordinate her presentation about Community Management, and it was very interesting. She seemed to be enjoying the event a lot. PS: Speaking of Stallman, there is a great video showing his "dance with the GNU" here (middle of page). It kind of shows the relaxed atmosphere of fisl, a great event where people congregate to celebrate not only free software, but also free culture in general. Semana passada nos divertimos bastante no fisl, em Porto Alegre, Brasil. É um evento gigante, com mais de 8.000 pessoas, e desta vez incluindo o Lula. Deixando a política partidária de lado, é legal ver suporte oficial para eventos de software livre. Isso com certeza dá mais credibilidade ao trabalho que estamos fazendo. O KDE estava presente em diversas palestras. Adenilson mostrou seu trabalho no kde-pim. Alexis Menard falou sobre Qt em várias plataformas. Tomaz Canabrava deu uma palestra introdutória sobre KDE 4, e Leonardo Cunha mostrou o Qt Kinetic. Sandro Andrade detalhou o seu trabalho em visualização para o KDevelop como parte do GSoC, and tivemos ainda dois painéis de uma hora cada no sábado: o primeiro foi o Encontro de Usuários e Desenvolvedores KDE Brasil, e o segundo um espaço para planejar nossas açoes em 2009-2010. Eu também dei uma palestra sobre desenvolvimento de jogos livres, focada em uma análise do kde-games e gnome-games, além de outros. A sala estava lotada (umas 200 pessoas acho), e a palestra estava sendo transmitida para outro local via vídeo, e devo confessar que no começo fiquei um pouco nervoso, especialmente porque nenhum dos meus dois computadores funcionou a principio com o projetor (era o cabo, ufff.) E o Stallman tinha falado antes no mesmo local, e demorou um pouquinho para se desconectar também 🙂 Mas tudo funcionou finalmente (obrigado ao Alessandro Silva pela ajuda), e a apresentação foi boa: pudemos iniciar uma discussão interessante a respeito de ferramentas para criação de jogos e as vantagens relativas de se usar técnicas 2D e 3D. Eu estou atolado de trabalho acumulado para fazer esta semana, mas prometo aprofundar esta discussão em um futuro próximo. Se você estava na palestra, logo teremos uma lista para discutir essas e outras idéias, e talvez algumas delas acabem em algum projeto do KDE logo logo. Mudando de assunto, foi legal conhecer a Leslie Hawthorn. Tive a chance de coordenar a apresentação dela sobre Gerenciamento de Comunidades, e foi bem interessante. Ela parecia estar gostando do evento bastante. PS: Falando no Stallman, tem um vídeo genial mostrando sua "dança com o GNU" aqui (meio da página). Mostra bem a atmosfera relaxada do fisl, um evento fantástico onde as pessoas se reúnem para celebrar não apenas software livre, mas a cultura livre em geral. Confirmed! This year we will again have a community gathering at fisl. It will be the second "Forum KDE Brazil for users and developers". If you are going to Poerto Alegre please use this opportunity to make our community stronger. I had a lecture proposal accepted as well. I intend to cover not only KDE, but also other open source game projects, including gnome-games. The title is: "Beyond Tetris and Minesweeper: is a revolution possible in FLOSS game projects?". From the abstract: "We can verify that, unlike what is happening on the desktop arena, FLOSS games are still distant from their proprietary counterparts, and this gap seems to be increasing quickly. Is there a way to revert this trend, using the strength of the community?" What is your opinion on this subject? Please use the comments or email-me, I want to bring these issues to the event and elaborate on them. Confirmado! Teremos novamente neste ano um evento comunitário no fisl. Será o segundo Encontro Brasileiro de Usuários e Desenvolvedores KDE. Para quem estiver em Porto Alegre é uma boa oportunidade de fortalecer a comunidade brasileira no projeto. Uma palestra minha foi aprovada também. Pretendo cobrir não apenas o KDE, mas também outros projetos de games open source, includindo o gnome-games. O título é "Além do Tetris e do Campo Minado: é possível uma revolução nos projetos de jogos em software livre?". Uma parte do resumo: "Podemos constatar que, ao contrário do que acontece no desktop, os jogos em software livre estão cada vez mais distantes dos seus equivalentes no mundo proprietário, e essa diferença está aumentando de maneira rápida. Será que existe uma maneira de se reverter este quadro, utilizando a força da comunidade?" Qual a sua opinião sobre este assunto? Use os comentários e email, pretendo abrir uma discussão sobre isso e levar as opiniões coletadas para o evento. The ProInfo project has just released version 3 of Linux Educacional, their Linux-based distribution bundled with computer labs for public schools in Brazil. This version has several new items, including a new EduBar (Java-based) and lots of content, 20GB of videos, text and animations. It is also built on top of Kubuntu 8.4, where previous versions used Debian. It is too early to tell how this will impact the project, but I find it positive that the team is evaluating different technologies, at least. Desktop is of course our beloved KDE 3.5, as development of this version started 8 months ago. I look forward for the day where we will have a KDE 4.2 or 4.3-based Linux Educational, and the team starts experimentation with plasmoids and other technologies introduced in our project, but I am happy they are apparently delivering on what was promised last year. I blogged about this project before here. One characteristic of the project I find interesting is their use of hardware and software to drive up to 10 different desktops from a single CPU. And no, this is not virtualization, and not a thin-client based solution as well. You can get more information about it from here . From my tests it seems to work nicely, and the station just "feels" like a normal terminal. So they are multiplying users (30,000 labs have already been delivered according to the latest info) , but not multiplying the emissions at the same rate, thankfully. According to this blogger the technology saves up to 80% of emissions, which is backed by numbers at the Userful site. Still according to him, and considering the project’s goal of 356.800 stations, this saving is equal to 170,000 tons/year in carbon emissions, or the same as 28,000 cars. This of course is super cool! I mentioned in my talk at Akademy 2008 that sharing a single CPU was the only way to provide labs to rural schools, as the electrical wiring was simply not capable of supporting 10 full machines turned on at the same time on remote locations. But I had not considered the emissions problem. So kudos to the team, as they are apparently on track in their "multiply users without multiplying energy consumption" goal. O projeto ProInfo acabou de lançar a versão 3 do Linux Educacional, a distribuição deles baseada em Linux e instalada nos laboratórios de informática das escolas públicas brasileiras. Esta versão tem diversos itens novos, incluindo uma nova EduBar feita em Java e muito conteúdo (20GB de vídeos, textos e animações). Esta versão usa como base o Kubuntu 8.4, enquanto as versões anteriores usavam o Debian. É muito cedo para dizer como isto vai afetar o projeto, mas eu acho positivo que o time de desenvolvimento esteja olhando para diferentes tecnologias, é um bom sinal. O desktop é claro o nosso amado KDE 3.5, já que o desenvolvimento começou oito meses atrás, no mínimo. Eu aguardo com ansiedade o dia em que eles vão disponibilizar um Linux Educacional baseado no KDE 4.2 ou 4.3, quem sabe com o time experimentando com plasmoids e outras tecnologias novas no nosso projeto, mas por enquanto estou feliz com o fato de eles estarem aparentemente entregando o que foi prometido no ano passado. Eu falei sobre este projeto antes, aqui. Uma característica interessante é o uso de hardware e software para suportar até 10 desktops diferentes com uma única CPU. E não, isto não é virtualização, e também não é uma solução baseada em thin-clients. Mais informações estão disponíveis aqui Nos meus testes parece funcionar muito bem, e a estação se comporta como um terminal comum. Então, eles estão multiplicando usuários (30.000 laboratórios já entregues), mas não estão multiplicando as emissões de carbono no mesmo ritmo, felizmente. Leiam mais neste blog : a tecnologia pode economizar até 80% das emissões, compatível com o que está no site da Userful. Ainda de acordo com o autor do blog, e considerando o objetivo de 356,800 estações do projeto, essa economia equivale a 170.000 tons/ano em emissões de carbono, o equivalente a 28.000 carros. Isso é bem legal. Eu mencionei na minha palestra na Akademy 2008 que compartilhar uma CPU única era a única maneira de se colocar laboratórios em algumas escolas rurais, já que a fiação elétrica não suportava 10 máquinas ligadas ao mesmo tempo. Mas eu não tinha pensado sobre a economia de energia. Parabéns à equipe do CETE, já que eles aparentemente estão conseguindo manter o objetivo de multiplicar os usuários, sem multiplicar os gastos de energia.